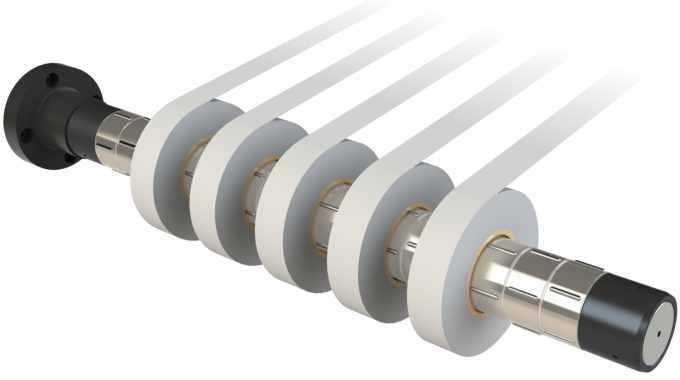 At the upcoming ICE Europe 2019 exhibition, Re SpA will debut new friction shafts designed to provide accurate post-cutting control on slitter rewinders. These have been designed for slitter rewinders that need to control accurately multiple and independent reels after the cutting process. The shafts are available in 3in and 6in diameters. The friction rings are equipped with gripping rolls with a wide supporting surface to guarantee grip of the reel cores. This works with cardboard and plastic cores. Different size friction rings are available according to the application/customer request. Re will also present the recently introduced WG.705 compact web guiding system and the SU.11 ultrasonic sensor. At the collocated CCE International, Re will showcase its new RotoSpring mechanical core chuck, designed to ensure safe and automatic ejection of paper reels. Rotospring features a patented spring system the guarantees ejection of rolls even when cores are damaged. ICE Europe and CCE International take place March 12-14 place in Munich, Germany.